DM: Deck Master or Diminished Modes? For the past few years Dungeons & Dragons owner Wizards of the Coast has enlisted the services of video game developer Stainless Games to craft a digital version of their widely popular and pioneering collectible card game (or CCG for short) Magic: The Gathering. Each year we have seen an improvement in the interface, playable modes, and fluidity of control. 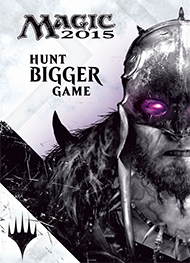 With Magic: The Gathering: Duels of the Planeswalkers 2015, the series has taken one giant step forward with its deck building feature, but also several steps back in gameplay and technical aspects, as well as dumping a hefty tab on gamers looking to unlock all the content. As always, you take the role of a Planeswalker–a magical being able to conjure mighty creatures, powerful sorcery spells, and potent artifacts, in an attempt to strike down your opponents. As a player, these tools of course come in the form of playing cards. With five colors to choose from--Black, White, Red, Green, and Blue--you can form fierce combinations of spells, played by using land cards which provides mana to cast these spells. Magic 2015 supplies the perfect tutorial for fledgling players interested in getting their feet wet with the card game but intimidated with the prospect of attending a Friday night game session at their local store or playing against friends with years of experience under their belt. You start by jumping through a brief campaign used primarily to showcase the different card types, and can also access more detailed guides in the help section, filled with combat pointers and deck building strategies. The game even features a store locator for when you're ready to take your real deck against real people. The final match in the tutorial demands you choose a pair of colors for your starting deck. Should the choice prove ineffective at subduing the final boss, you can select a different hybrid. However, upon victory it becomes your starting deck, which you must carry through the first campaign in the black plane of Innistrad and some time afterwards until you've unwrapped enough booster packs to create your first plausible custom deck from scratch. Once able though, you'll find that the deck building process is the smoothest in the series thus far. A sleek set of filters allows you to separate your cards by type, rarity, cost, and color. You can then scan through your trimmed selection and quickly swipe choice cards down into your newly formed deck. 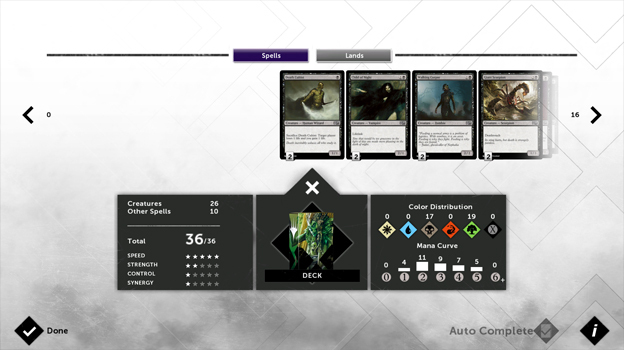 A properties bar lets you see the distribution of color, cost, and card types in your deck, and also provides a gauge of the deck's speed, strength, control, and synergy. You can even select a few prized cards and let the computer auto-complete the deck, although I've found I've still had to change out a few mundane cards and adjust the quantity of land cards, so don't hit the auto-complete and blindly head off to your next match. The best part about the deck building process is how quickly you can put together a formidable library and get into the action, which itself sadly is not as brisk. Having played both the Steam and iPad version, it is very easy to deduce that the interface in Magic 2015 favors the tablet. Scrolling menu screens are designed for finger swipes, as is flicking cards into play during a match and double-tapping cards to glean more detailed information. The mouse, on the other hand, feels like an archaic tool that is cumbersome at navigating the board and menus. The matches themselves (due to the rules of the game) require some patience. Since players can counter at any point with Instant spells, the game must allow a timer in between each phase. 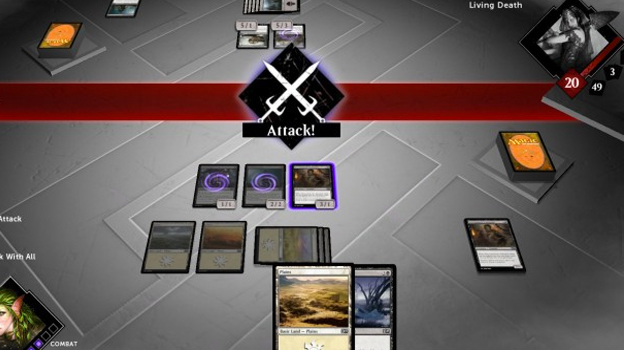 Though brief, games still can drag on, especially when playing four-player matches with dozens of creatures littering the board and all the attack and blocking decisions to be made. Thankfully the game allows you to cut the battle animations, saving you from watching each attack, a lesson I learned after being pummeled into submission during my first multiplayer match against a horde of sixty spiders thanks to my opponent stacking their deck with four Spider Spawning cards.